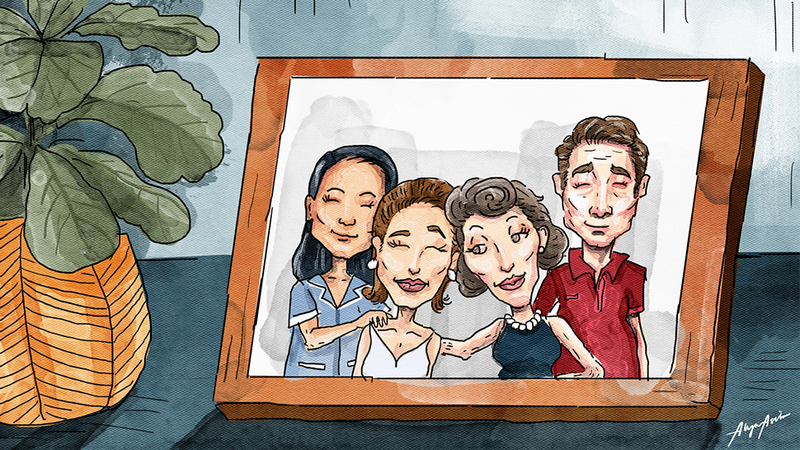 A look at one of America's most beloved leader's life and work, from childhood through his presidency. 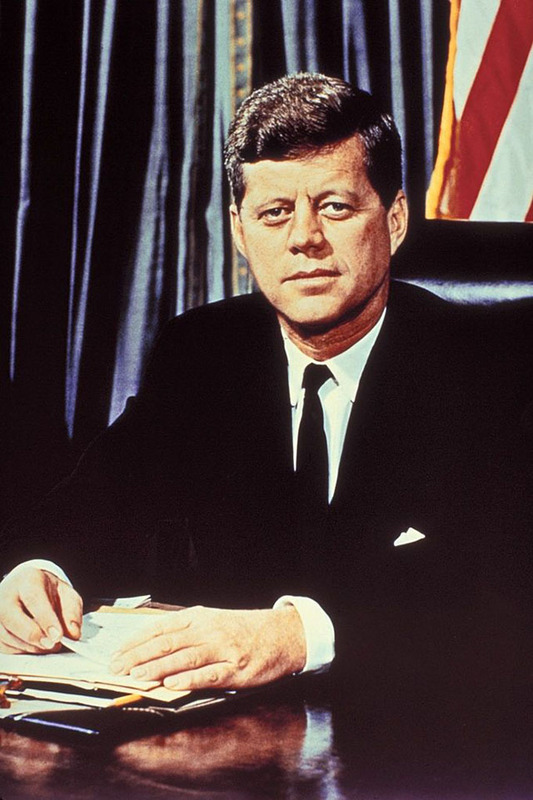 John F. Kennedy was the 35th U.S. president and one of the youngest to hold office. 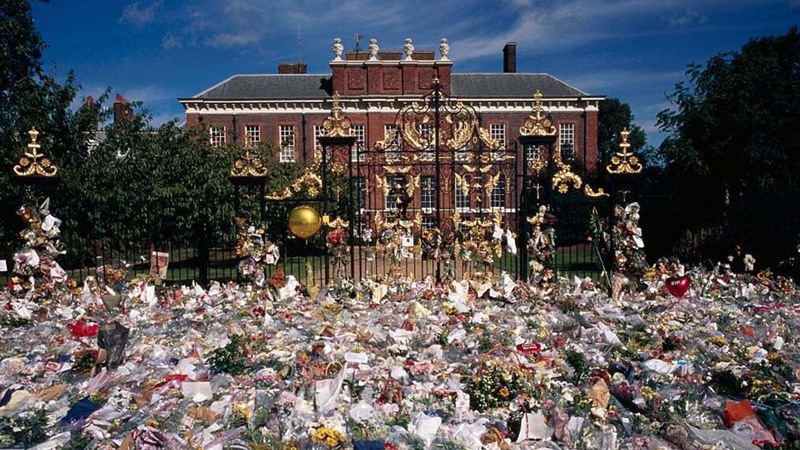 We take a look back at his life, which was tragically cut short at the age of 46. 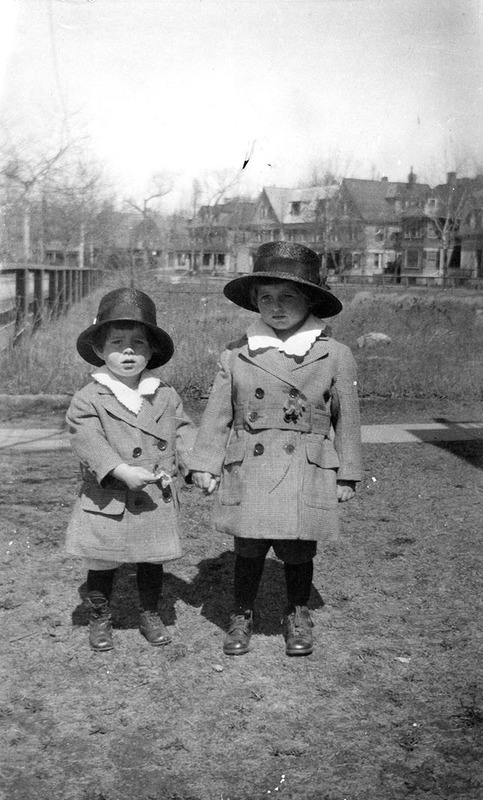 John F. Kennedy (left) with his older brother Joseph. 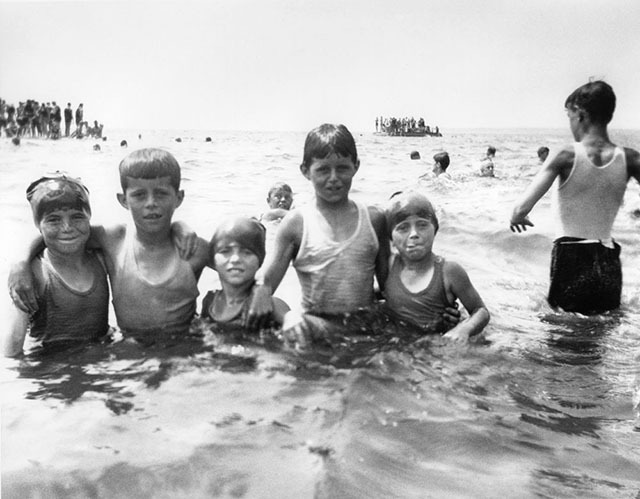 John Kennedy, nicknamed "Jack," and his siblings go for a swim in Hyannis Port. 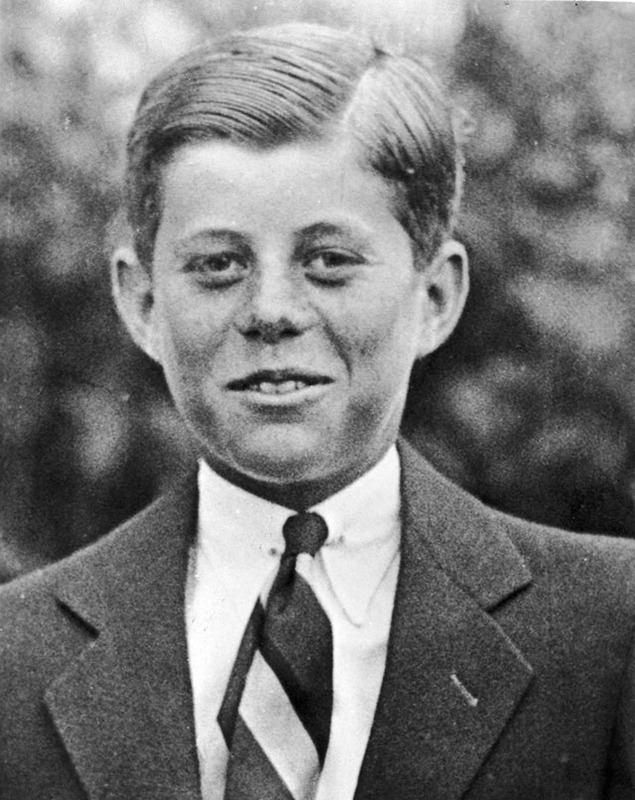 A young JFK pictured here at age ten. 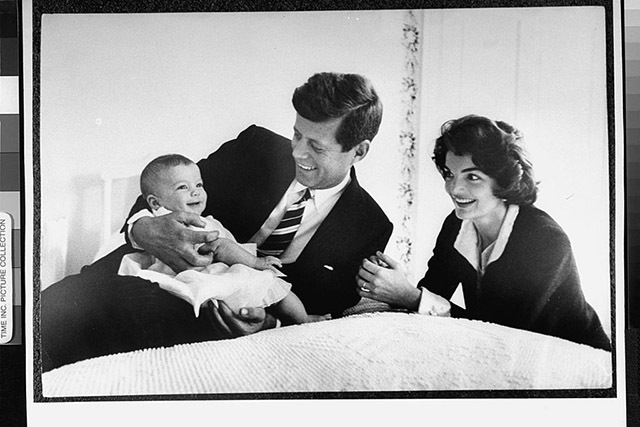 President Kennedy started sports at a young age. 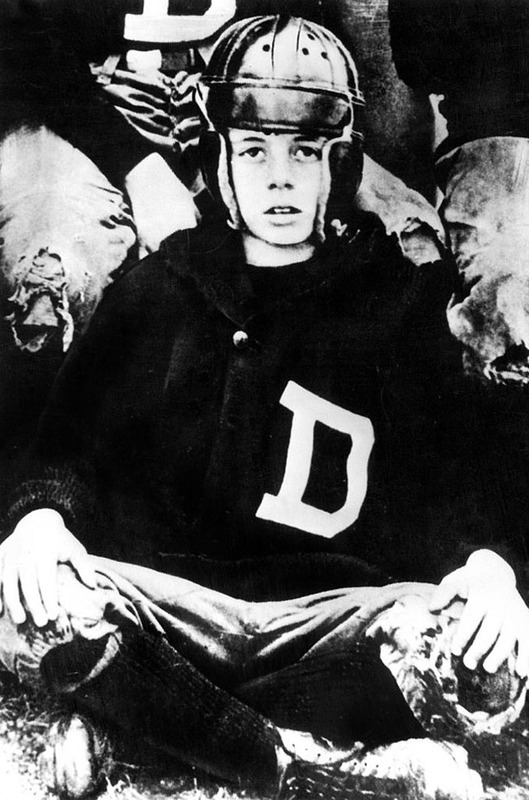 Here he is at age ten in a football uniform. 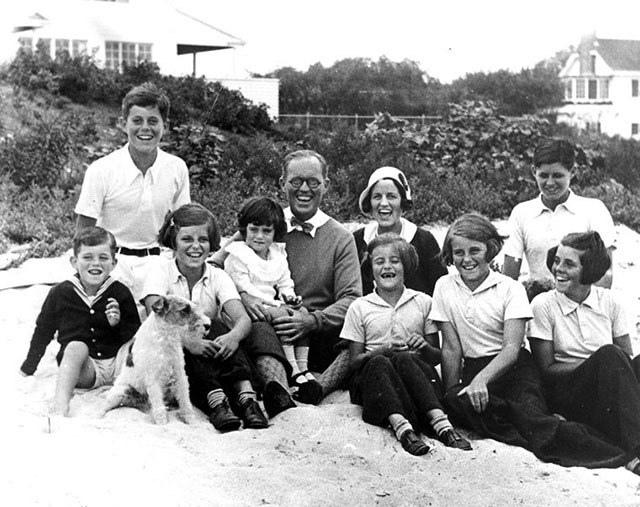 The whole Kennedy family at the beach. 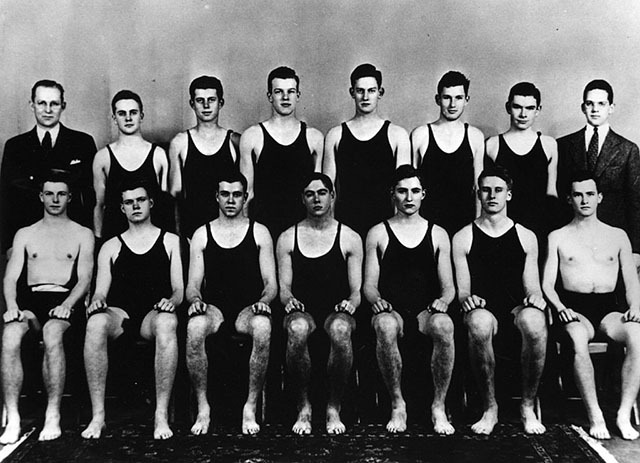 In college, Kennedy was a member of the Harvard Swim Team; he's pictured here in the back row, third from the left. 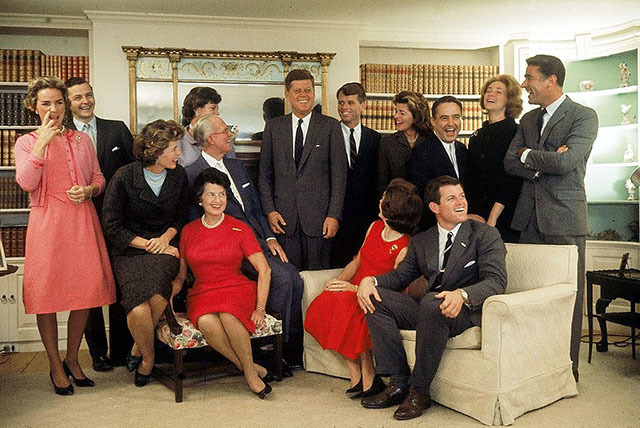 This family portrait shows just how large the Kennedy clan was. 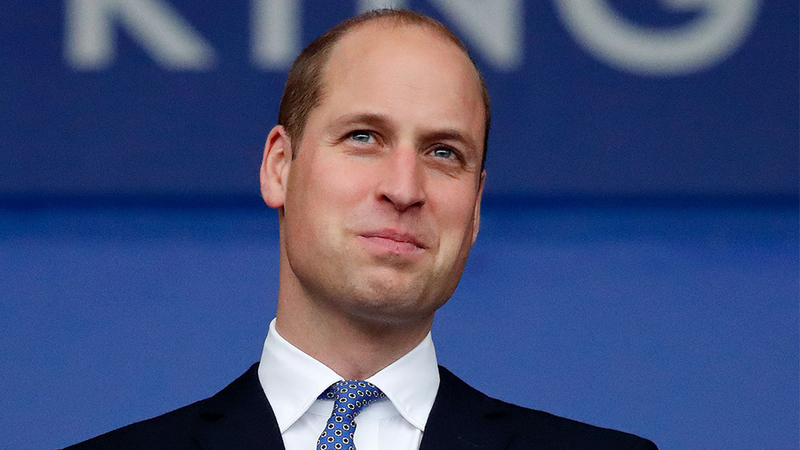 Jack was the second oldest of nine children. 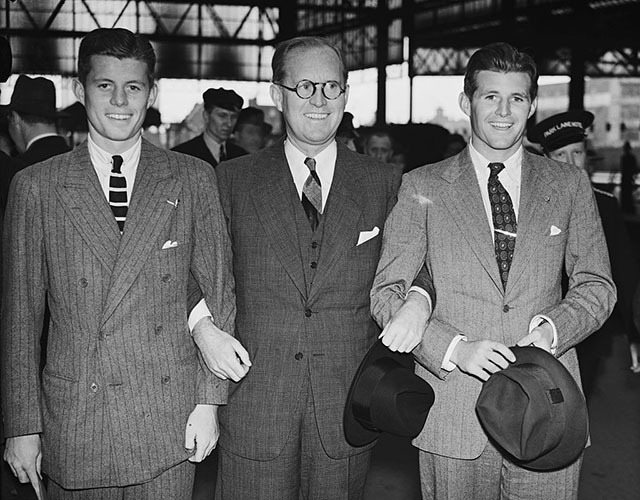 JFK and his brother Joseph Kennedy Jr. in London with their father, Joseph Kennedy Sr., who served as the American ambassador to Great Britain. 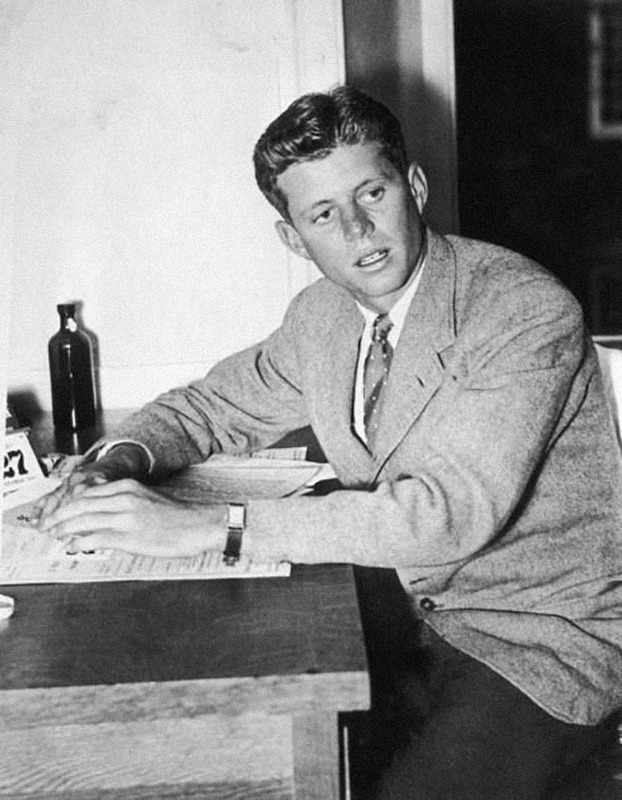 A weary-looking Kennedy as an undergraduate at Harvard University. 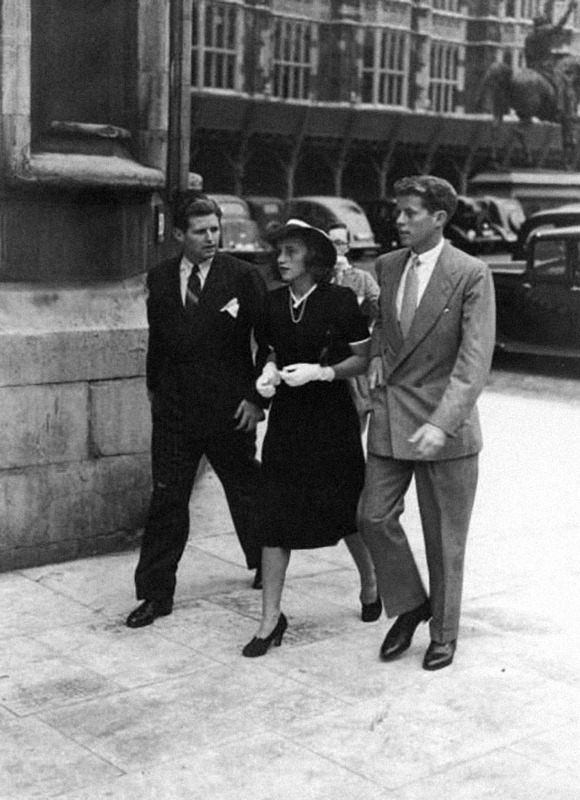 Three Kennedy siblings (Joe, Kathleen, and John F. Kennedy) arrive at the Houses of Parliament in London, during their father's tenure as American ambassador to Great Britain. 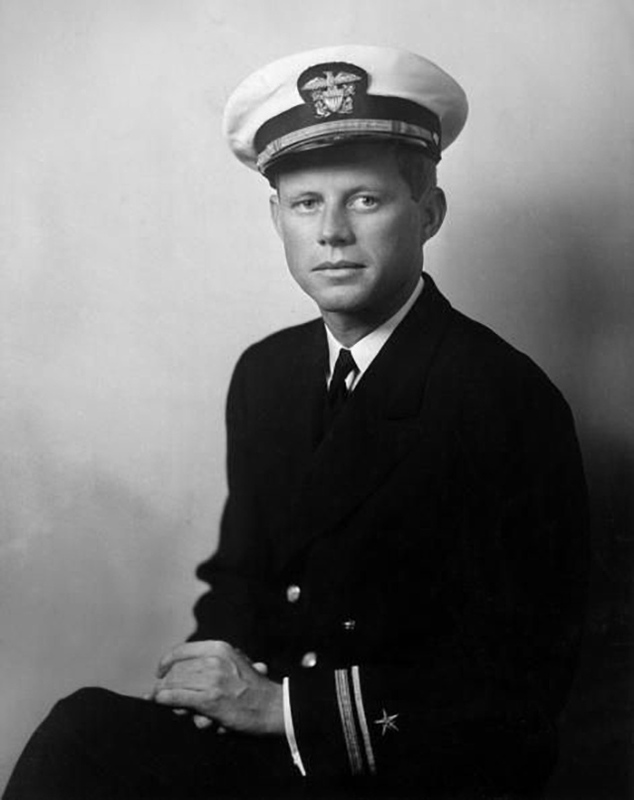 JFK served in the Navy during World War II. 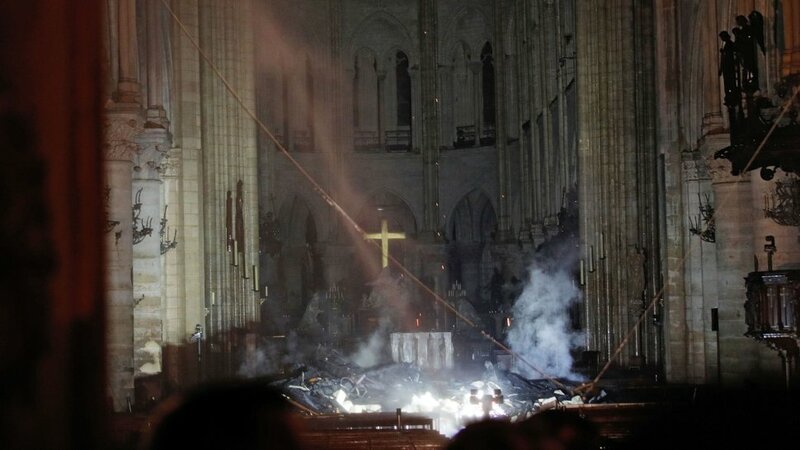 He was lauded as a hero for rescuing fellow crew members after their ship was destroyed in a Japanese attack. 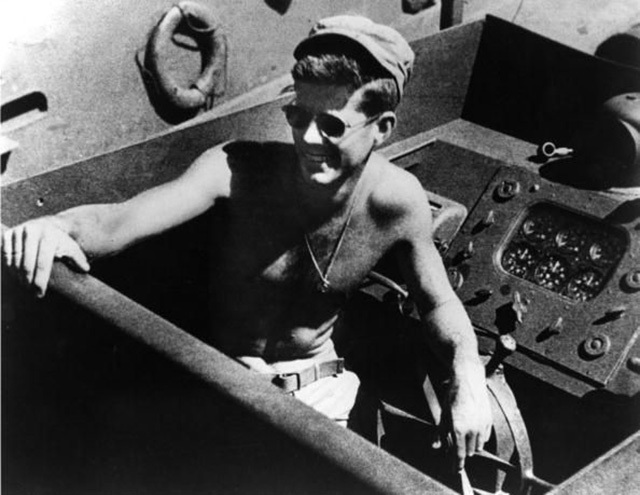 Here he is, pictured aboard the torpedo boat he commanded in the Pacific. 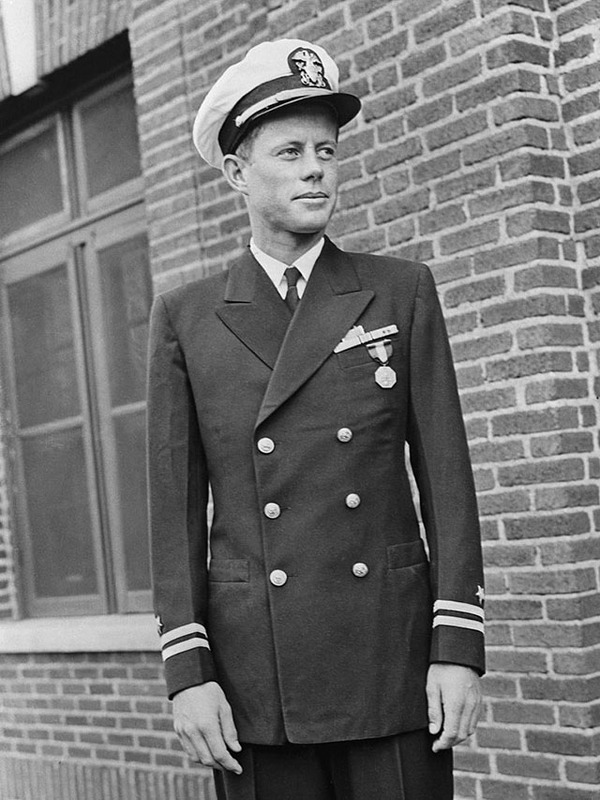 As a lieutenant in the Navy, Kennedy was a PT-boat commander. 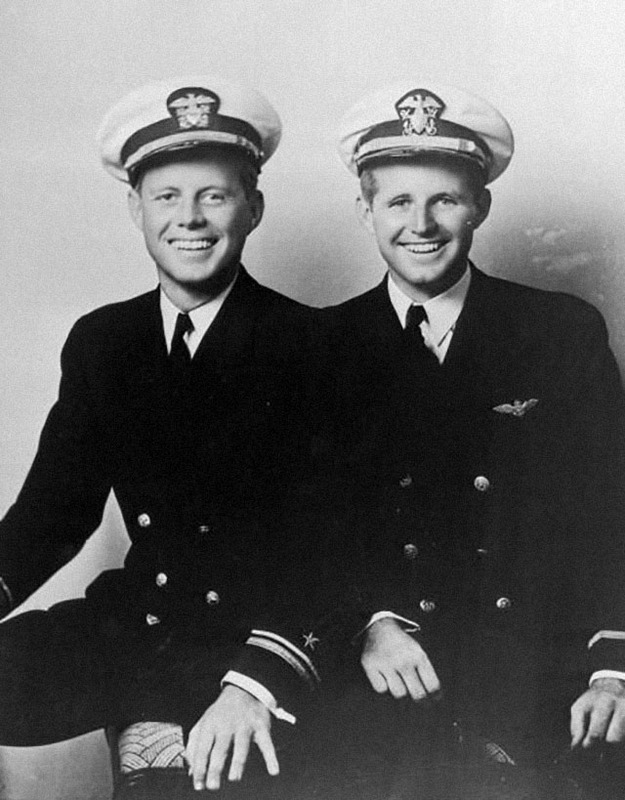 A portrait of the Kennedy brothers, John F. Kennedy (left) and Joseph Kennedy Jr. (right), seated in their naval uniforms. 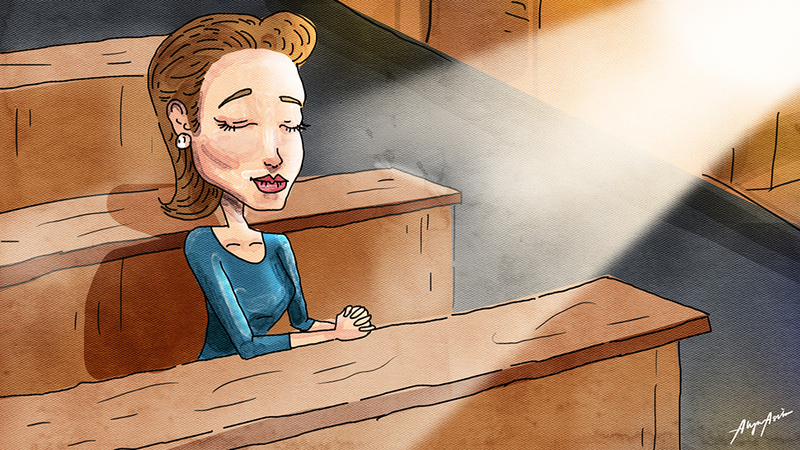 Kennedy first ran for Congress in 1946. 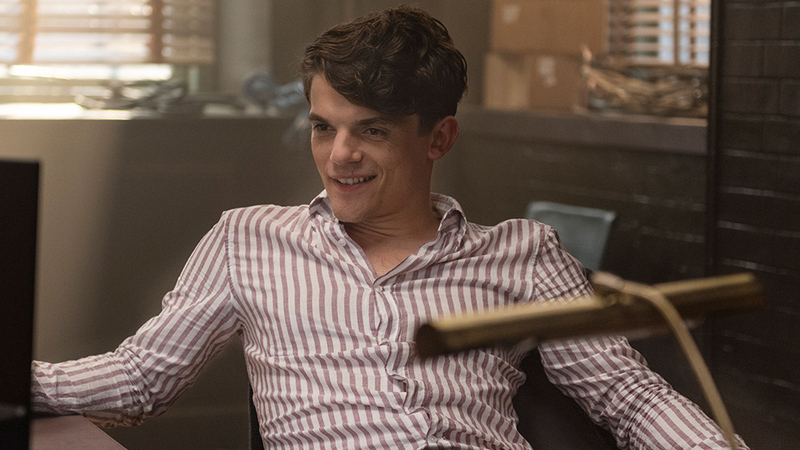 Here he is relaxing during the campaign. 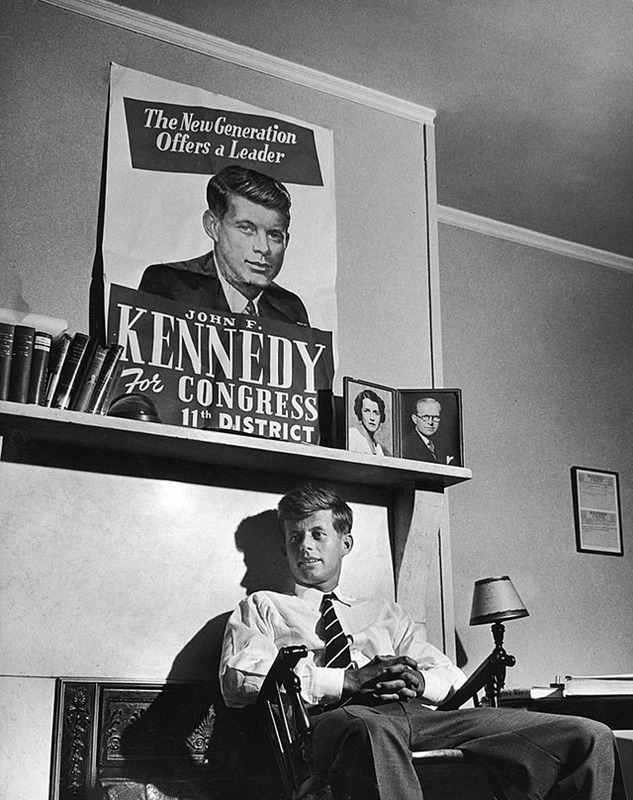 A portrait of Representative Kennedy during his first term. 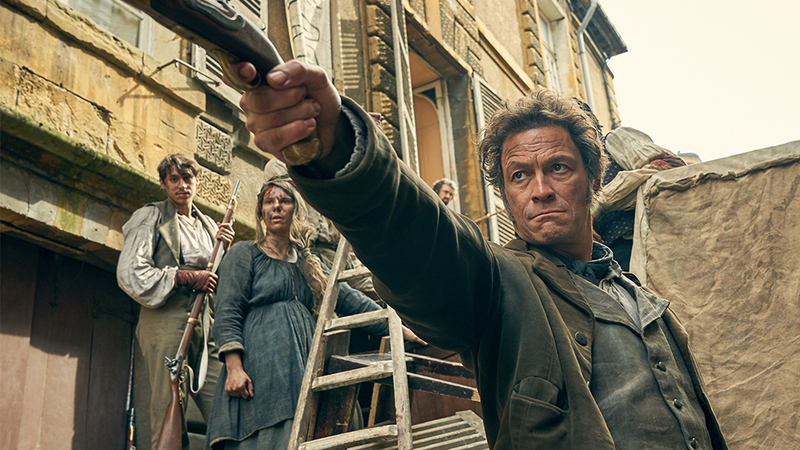 He's pictured here working as a member of the House of Representatives. 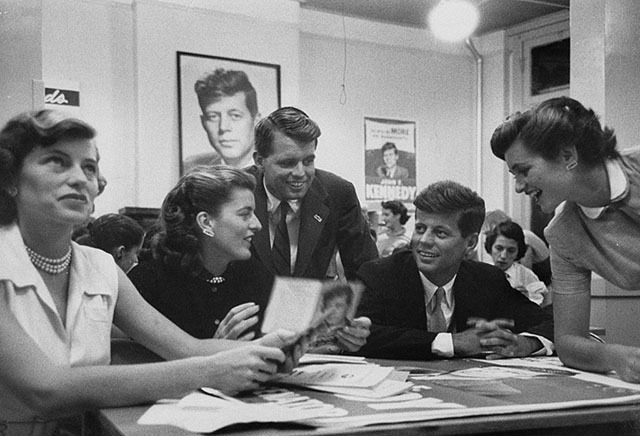 John F. Kennedy gets help from his siblings during his Senate campaign. 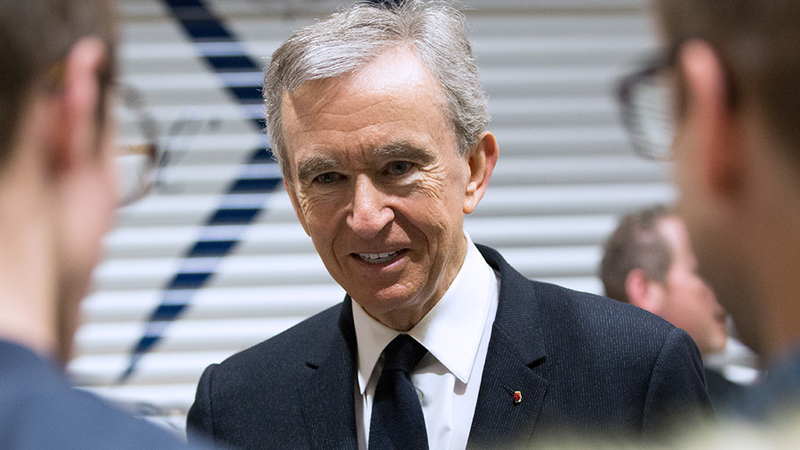 He served as the junior senator from Massachusetts for eight years. 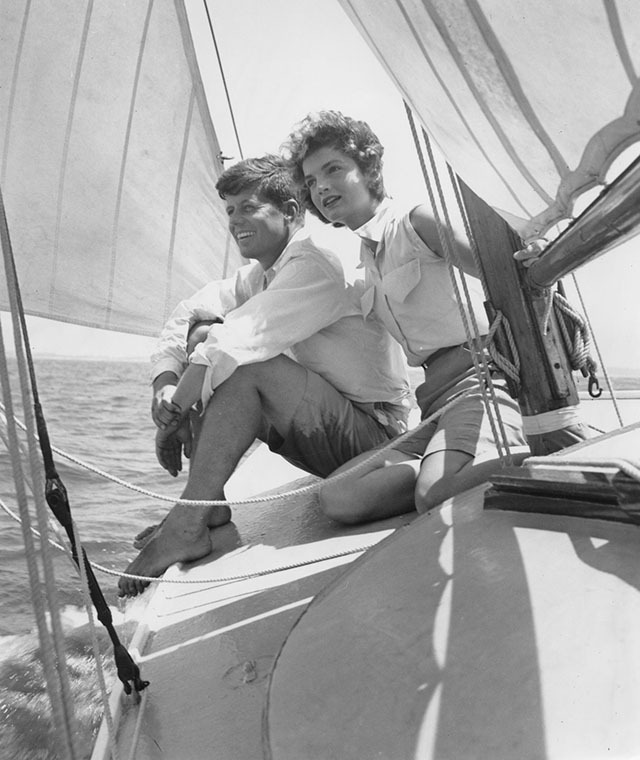 Kennedy goes sailing with his fiancé Jacqueline Bouvier during a trip to the Kennedy family home in Hyannis Port, on the cape. Kennedy and fiancé Jackie chat on the grass together in Massachusetts. 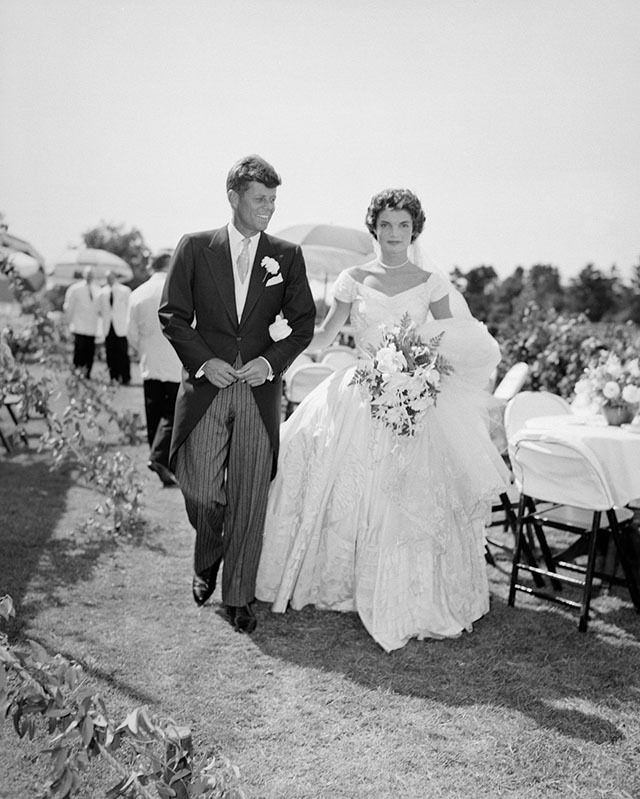 John and Jackie Kennedy moments after tying the knot in Newport, Rhode Island. 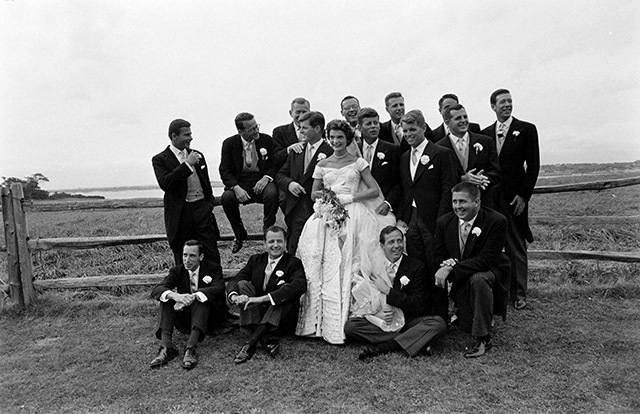 Jackie Kennedy poses with the groomsmen and her new husband at her wedding. 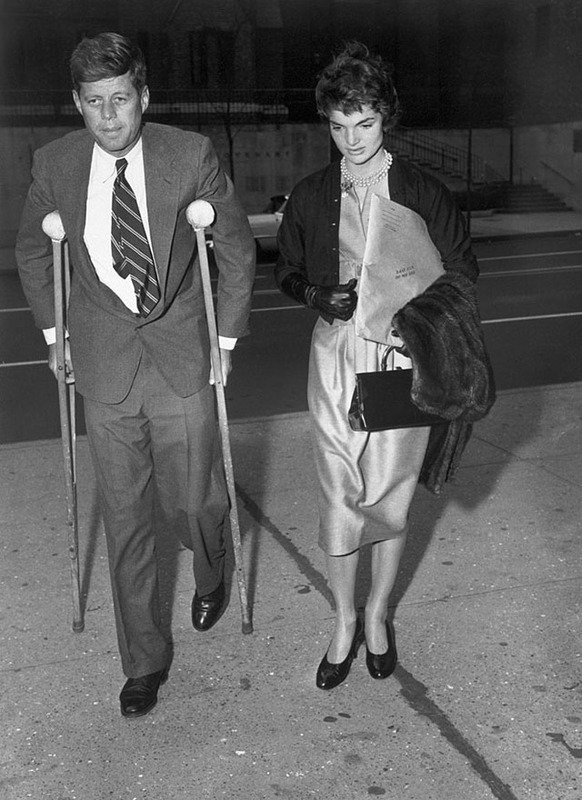 Jackie helps JFK to the hospital for a post-war spinal operation. 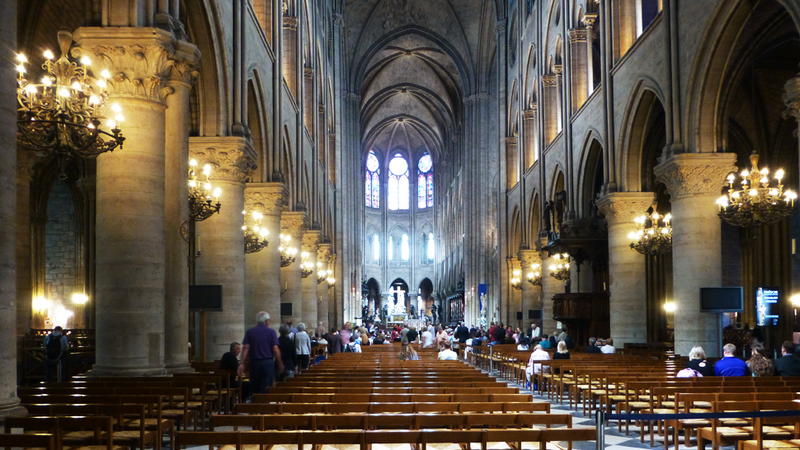 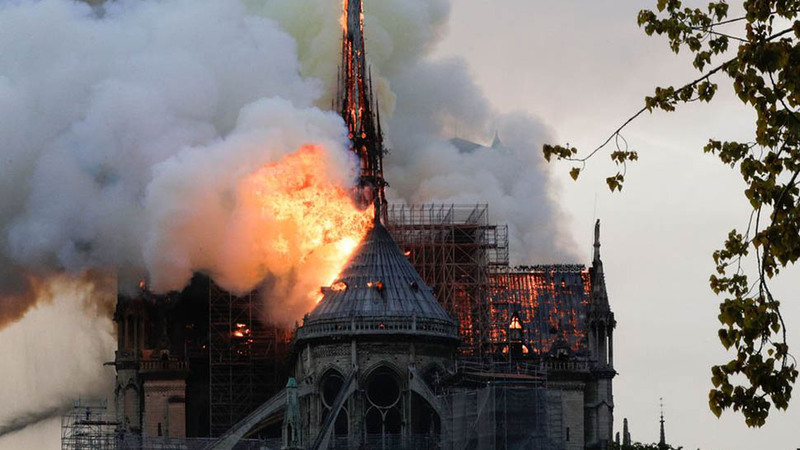 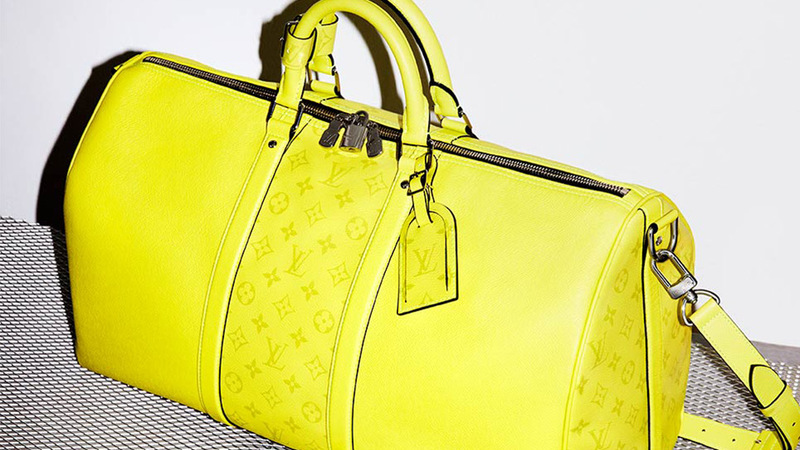 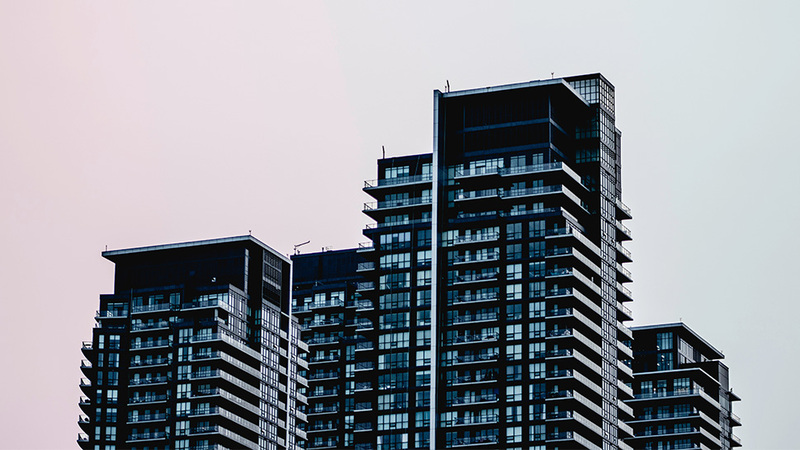 Following the procedure, he had to rely on crutches for three months. 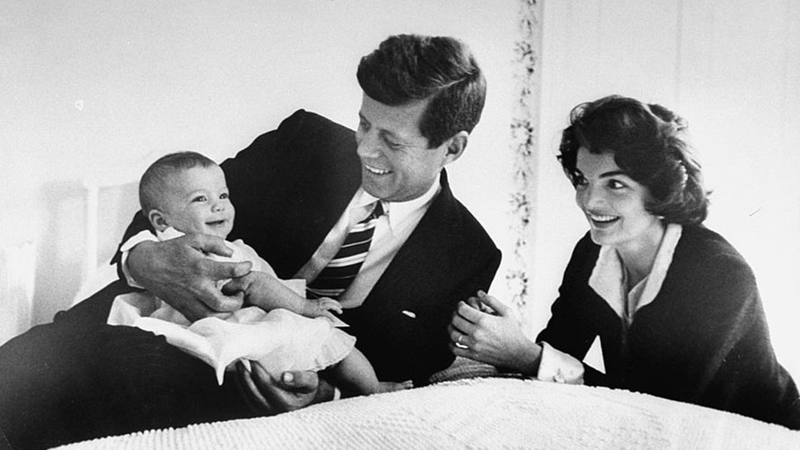 A Kennedy family portrait with their first child Caroline Kennedy, four months after she was born. 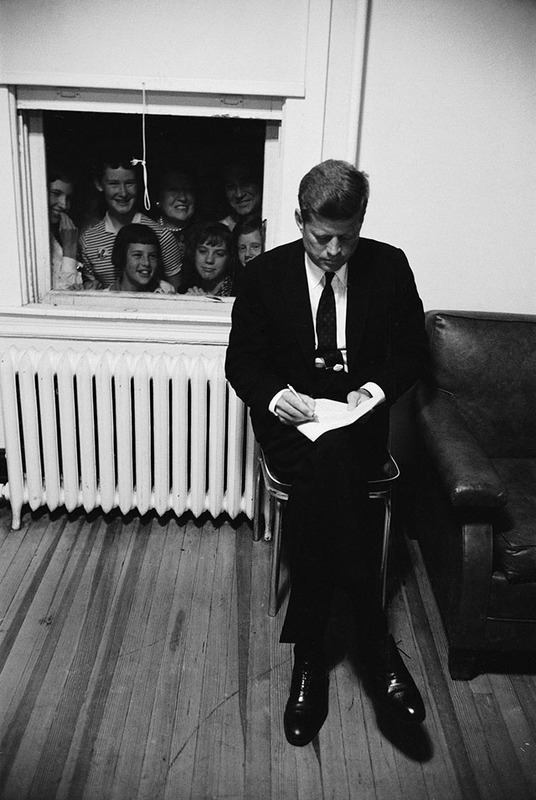 In early 1960, JFK begins his presidential campaign. Here he is with brother Robert, likely discussing strategy. 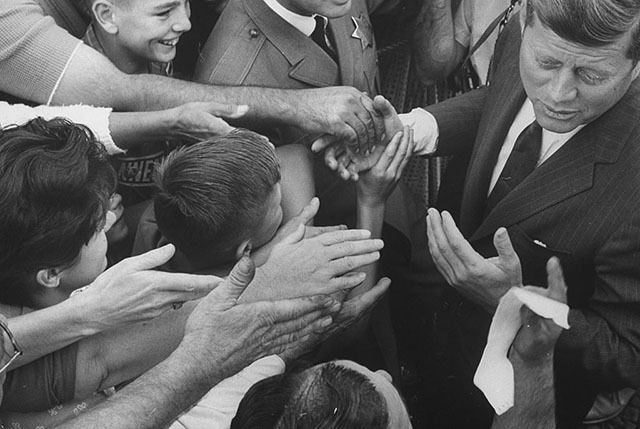 Kennedy shaking hands during his campaign tour. 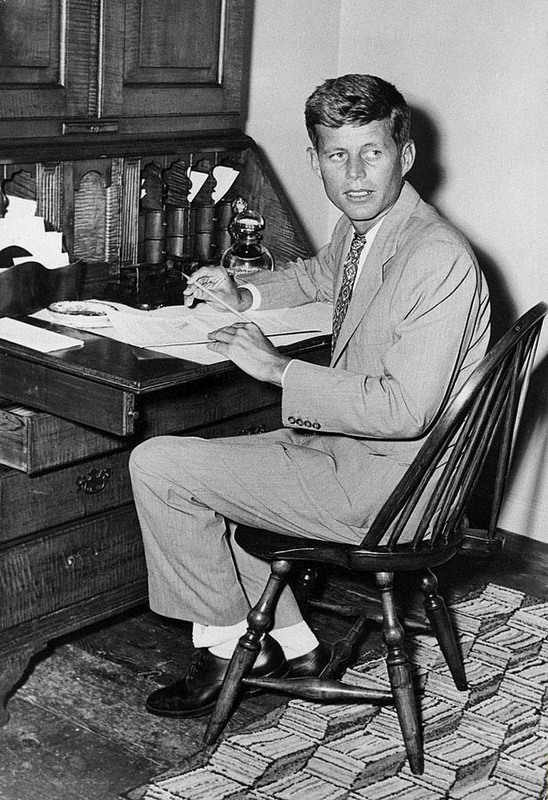 Senator Kennedy making notes during his presidential campaign. 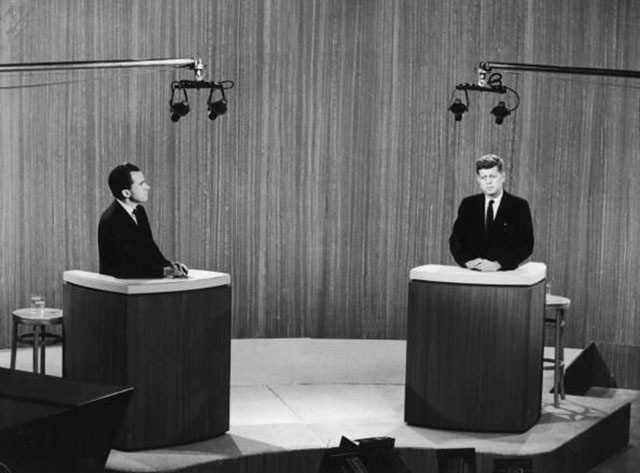 The televised debate between candidates Richard Nixon and John F. Kennedy is what many think clinched the election for the young senator. 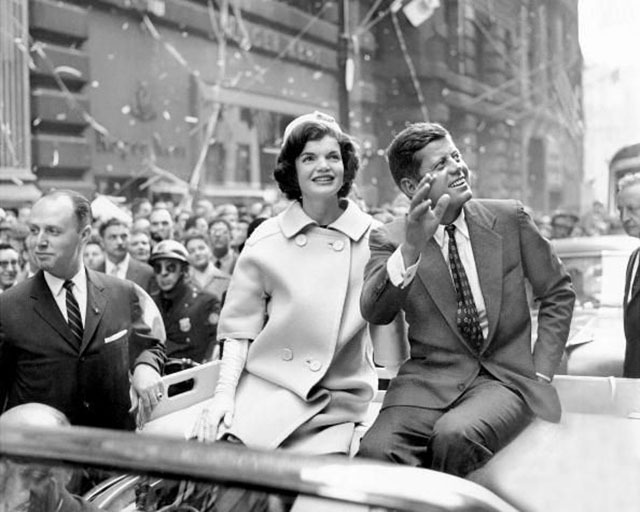 New York City celebrates the Kennedy campaign with a ticker-tape parade. 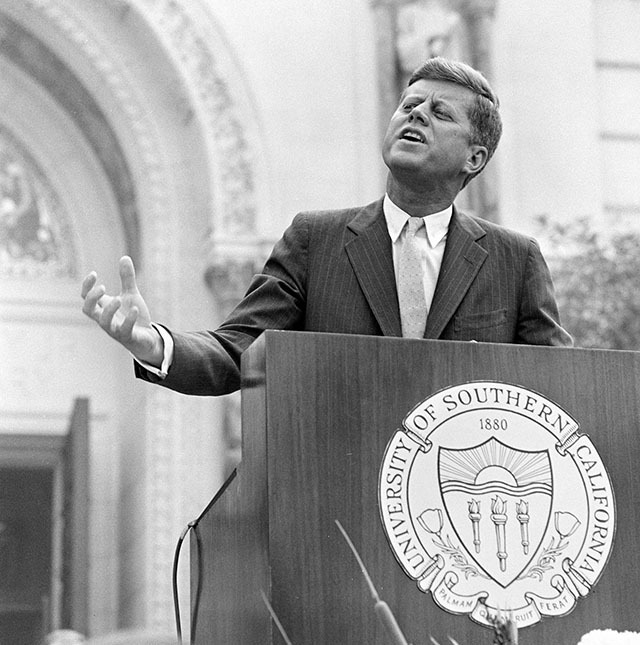 Senator Kennedy speaks to students at USC one week before he is elected. 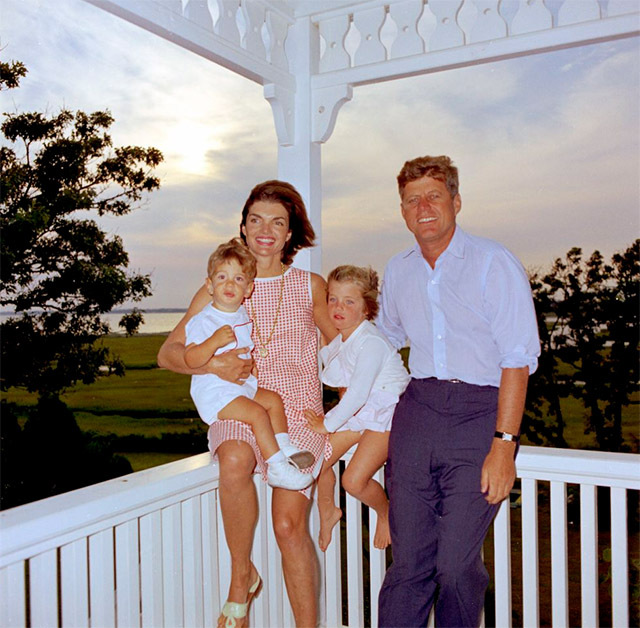 The night after the election, the Kennedy family gets together to celebrate in Hyannis Port. 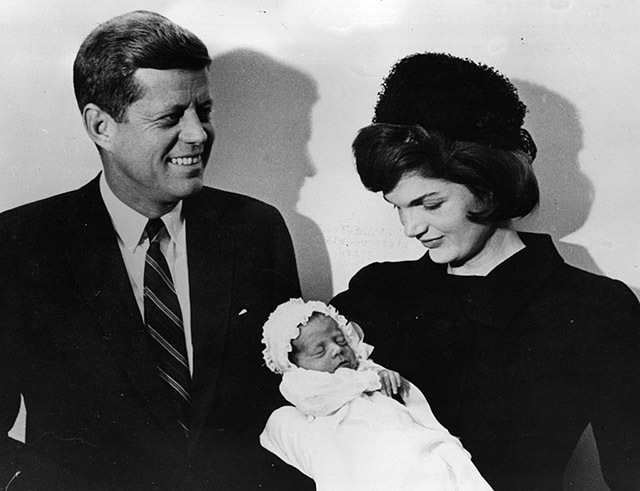 John F. Kennedy Jr. was born just weeks after JFK was elected. 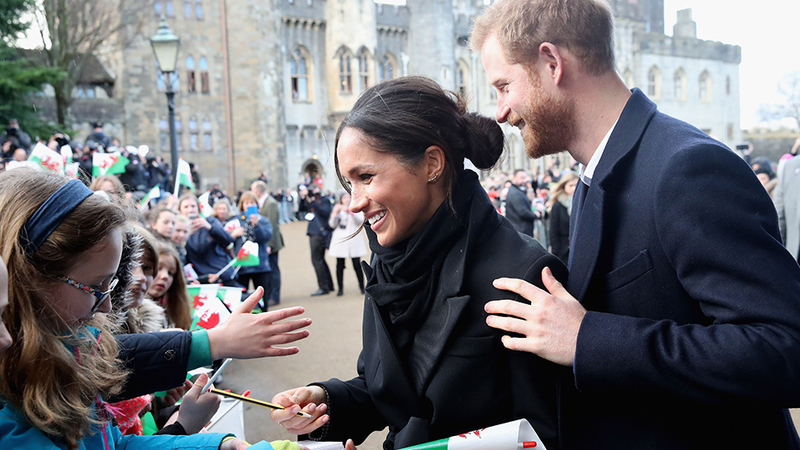 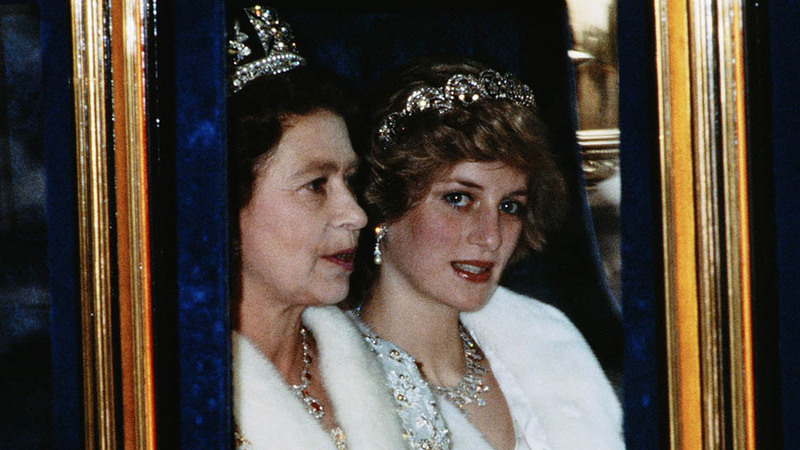 The new president and first lady stand in front of the crowd at the inauguration. 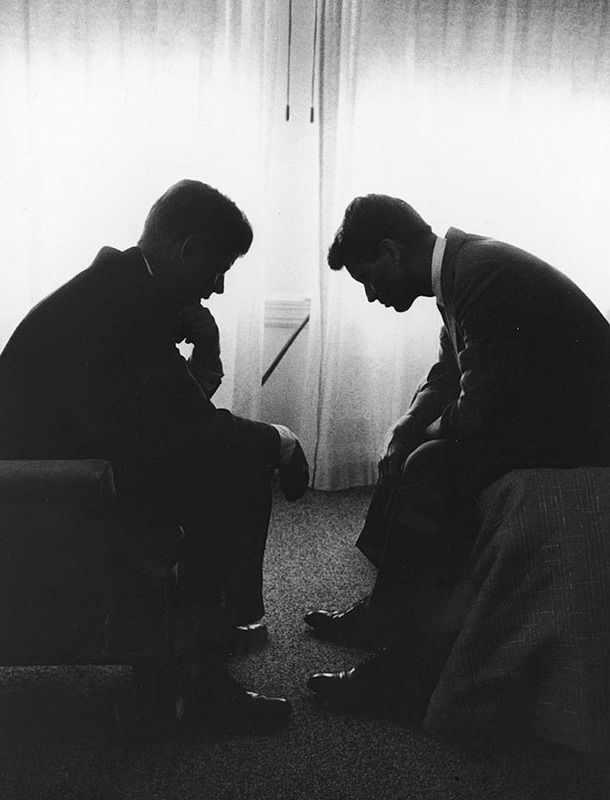 It was during his address that Kennedy famously said, "Ask not what your country can do for you. 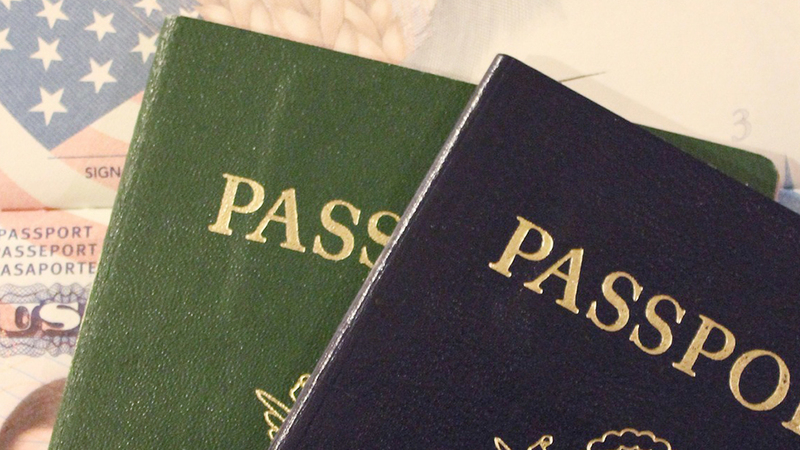 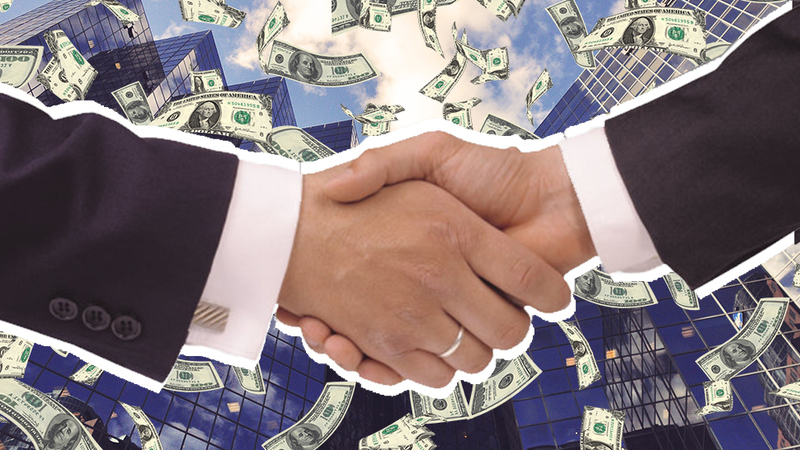 Ask what you can do for your country." 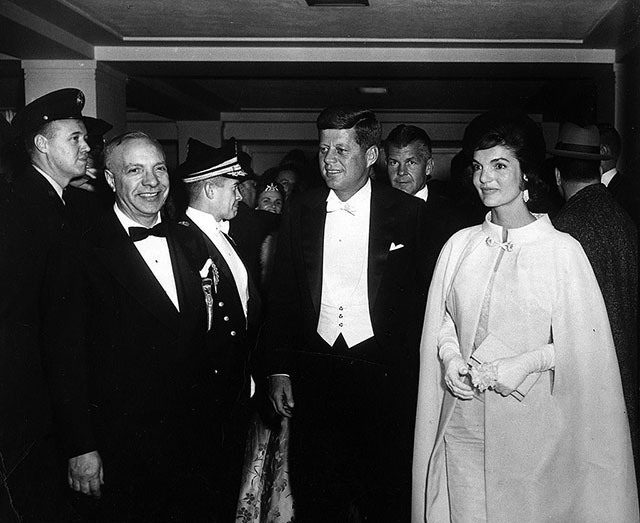 The first couple arrives at JFK's inaugural ball. 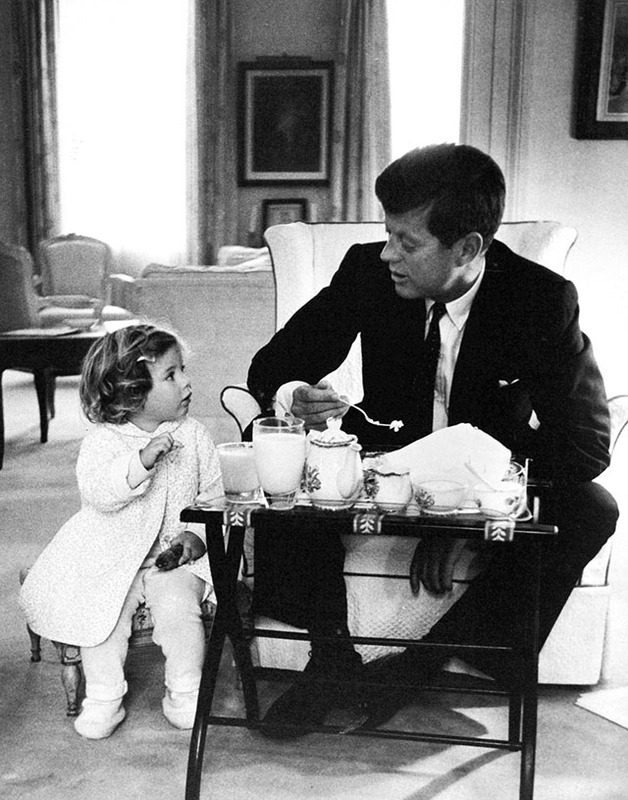 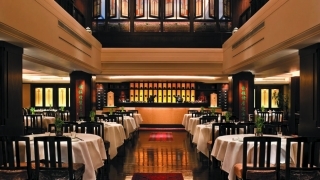 The president sits to eat breakfast with First Daughter Caroline Kennedy. 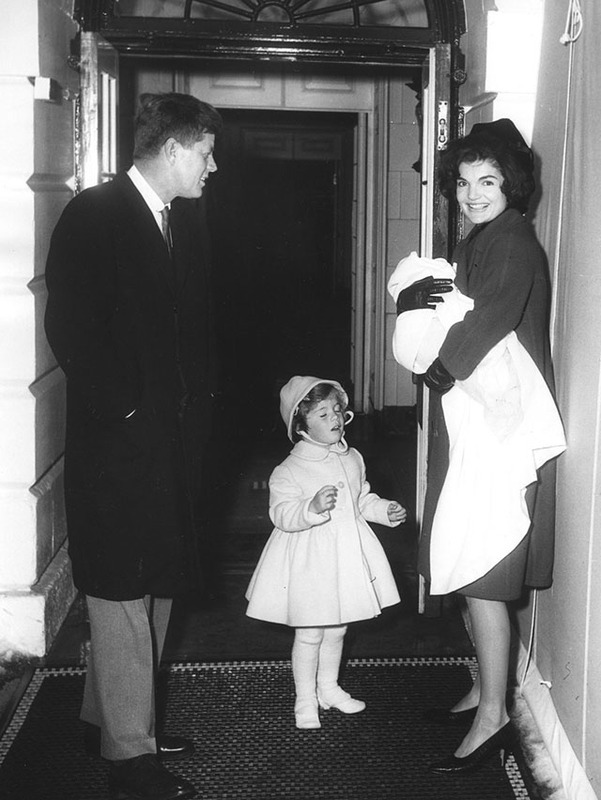 President Kennedy and the First Lady with their daughter Caroline and their newborn son John Kennedy Jr. in front of the White House. 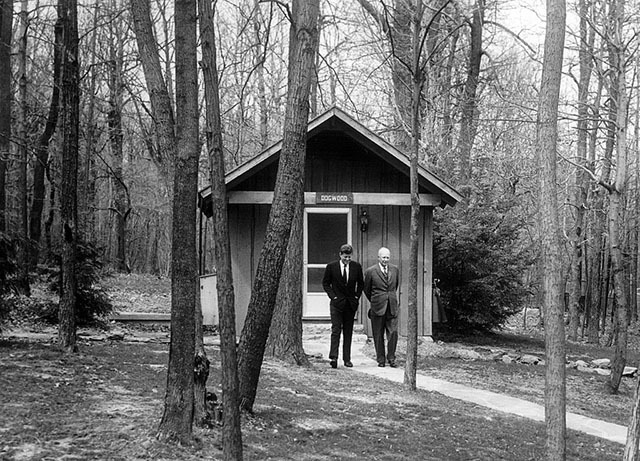 President Kennedy takes a walk at Camp David with former president Dwight D. Eisenhower. 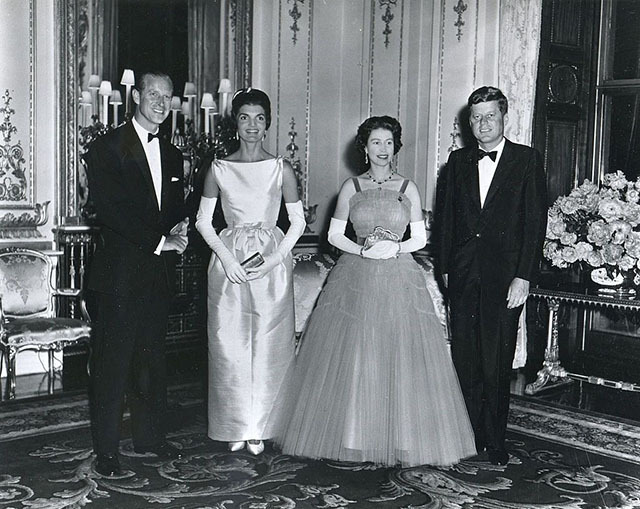 JFK with Queen Elizabeth II at Buckingham Palace for a banquet in the president's honor. 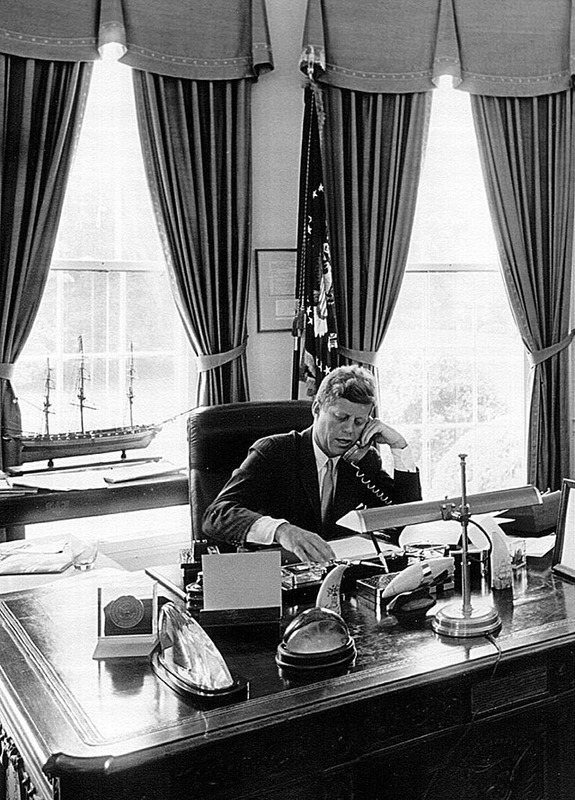 President Kennedy takes a call in the Oval Office. 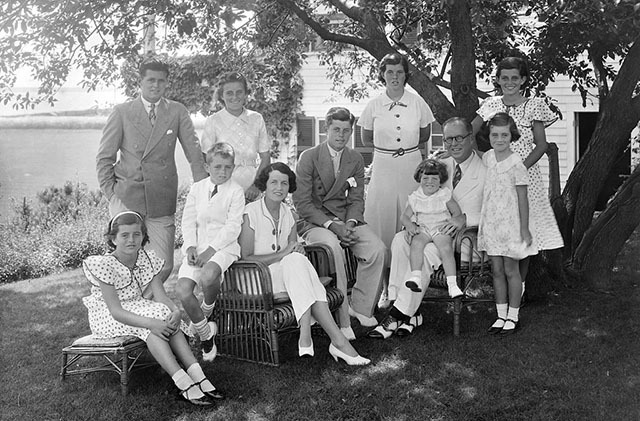 Kennedy (seen here posing on a porch in Hyannis Port) valued his time in Cape Cod. 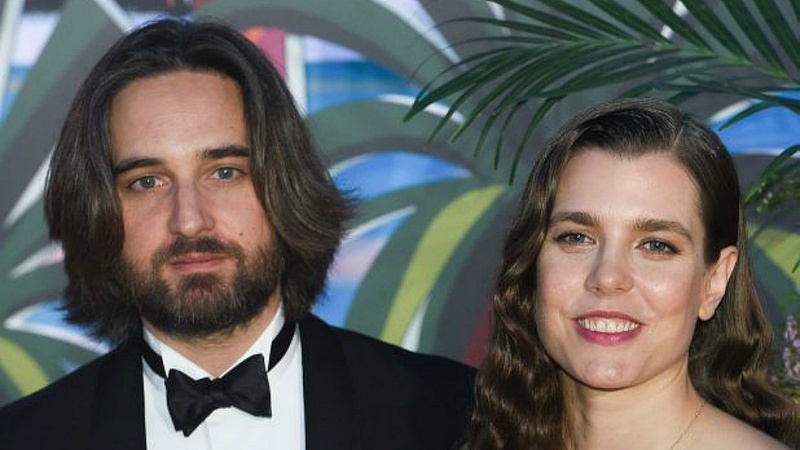 "I always come back to the Cape and walk on the beach when I have a tough decision to make," he said. 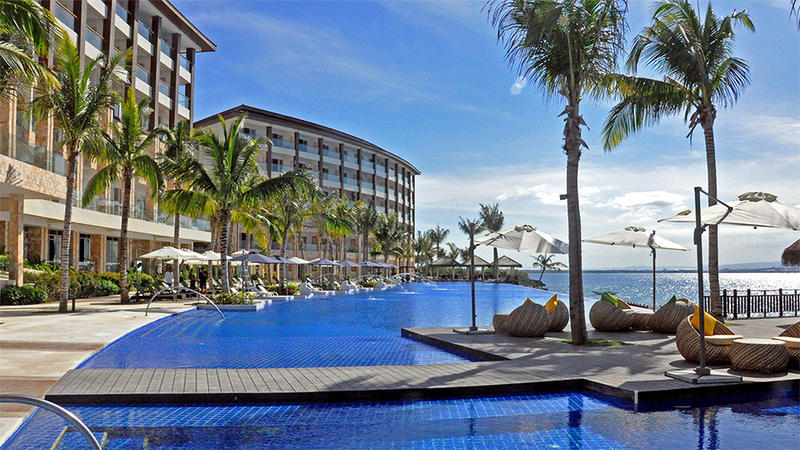 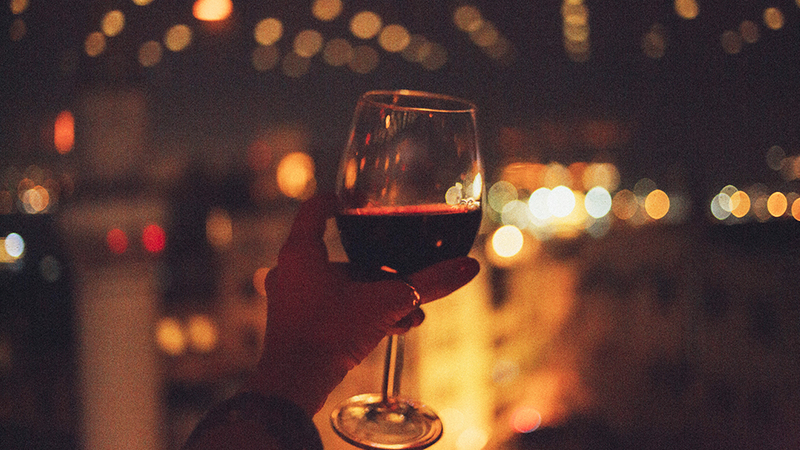 "The Cape is the one place I can think, and be alone." 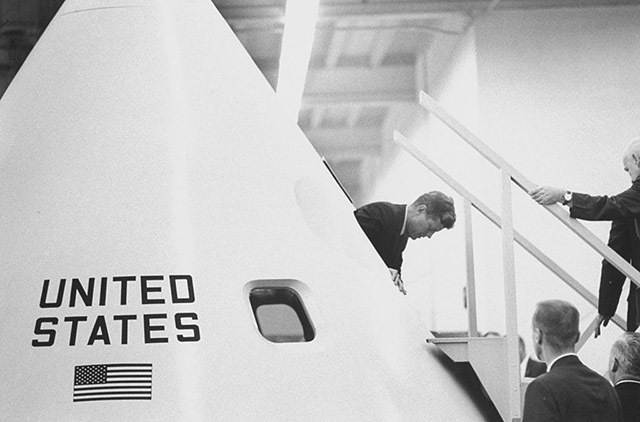 Here, President Kennedy gets a tour of the Apollo space capsule. 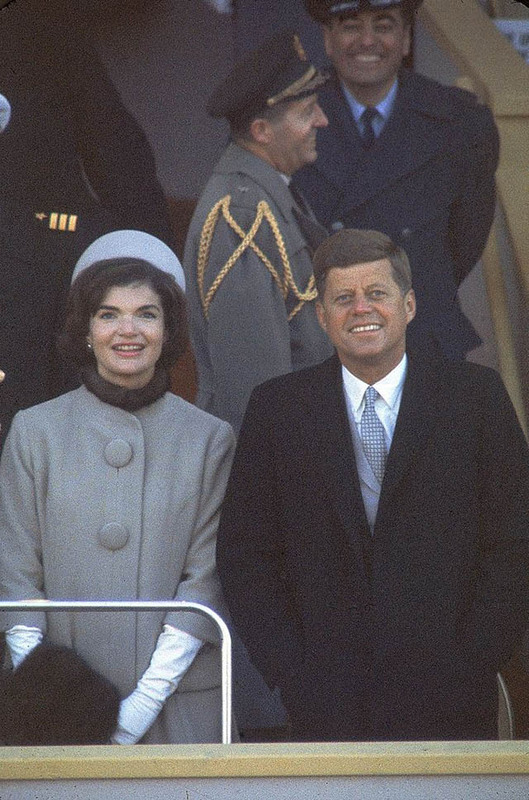 During his administration, Kennedy declared that American would put a man on the moon within the decade, and he was right. 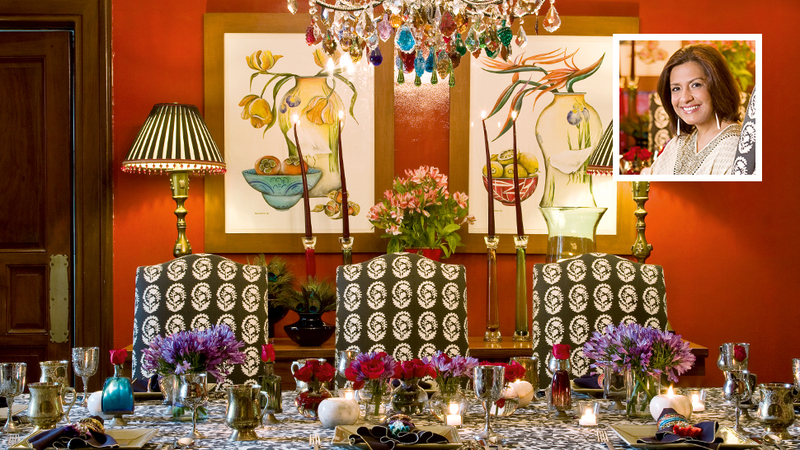 Christmas in the Kennedy house. 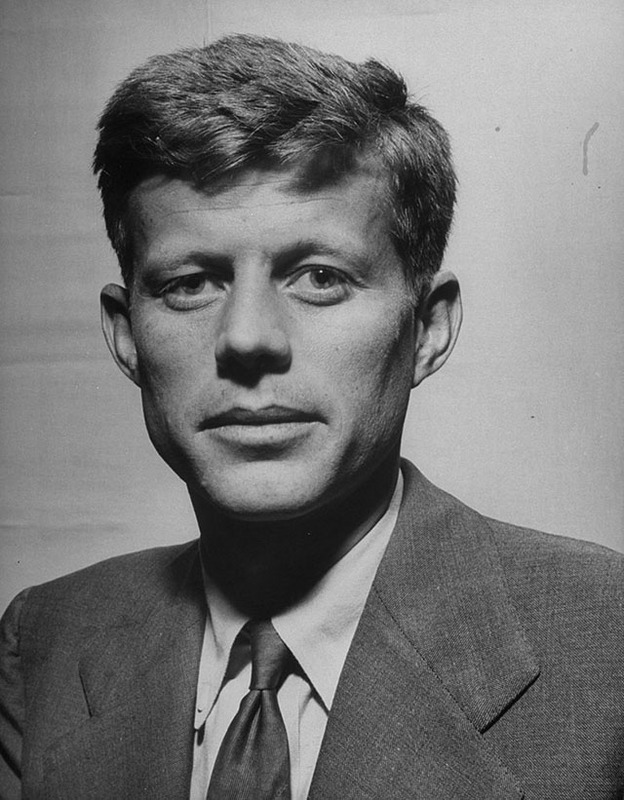 John F. Kennedy's presidential portrait. 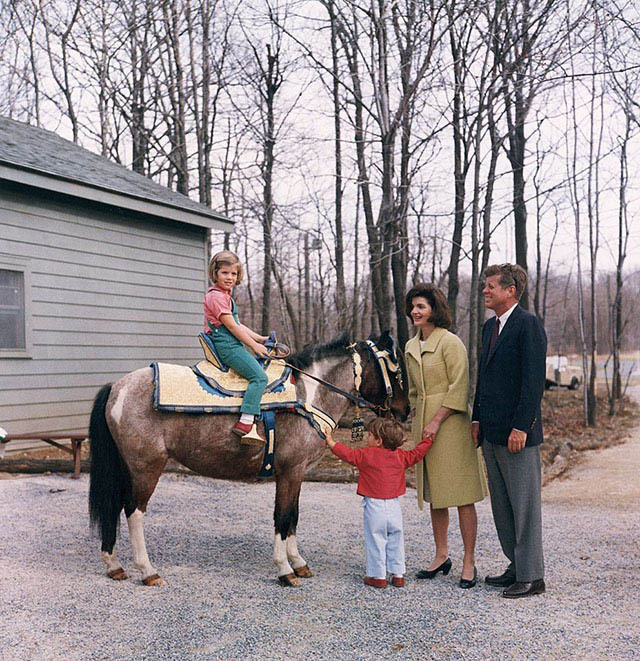 The young Kennedy family pictured with Caroline's pony Macaroni. 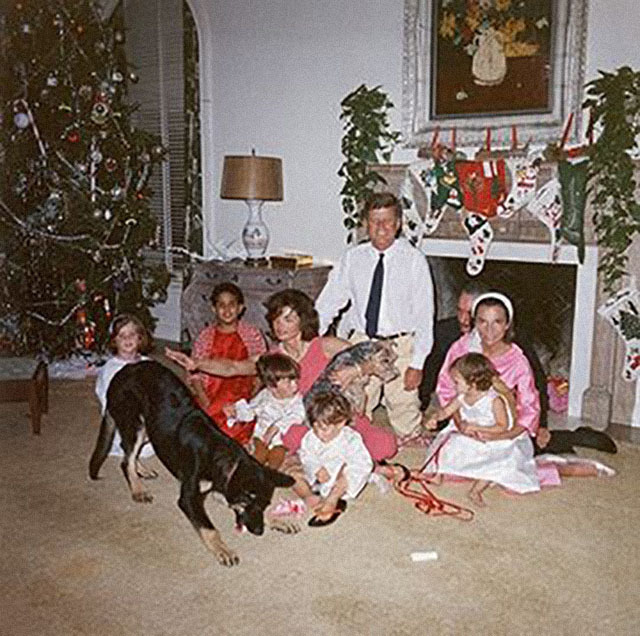 In addition to the horse, the Kennedys had a veritable menagerie at the White House including birds, cats, rabbits, hamsters, and multiple dogs. 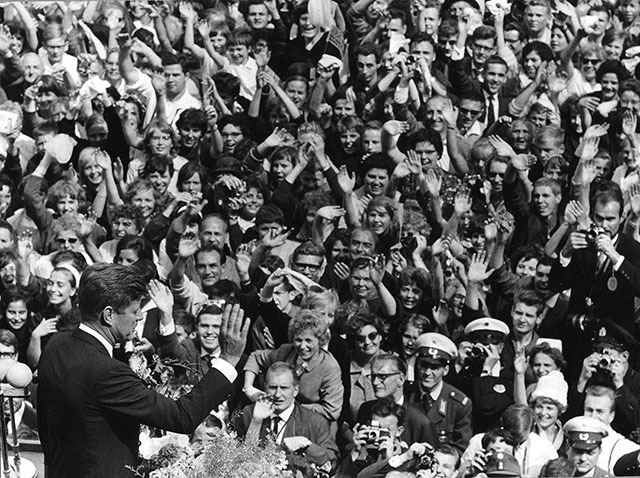 On June 26, 1963, Kennedy gave his famous "Ich Bin Ein Berliner" speech against the backdrop of the Berlin Wall. 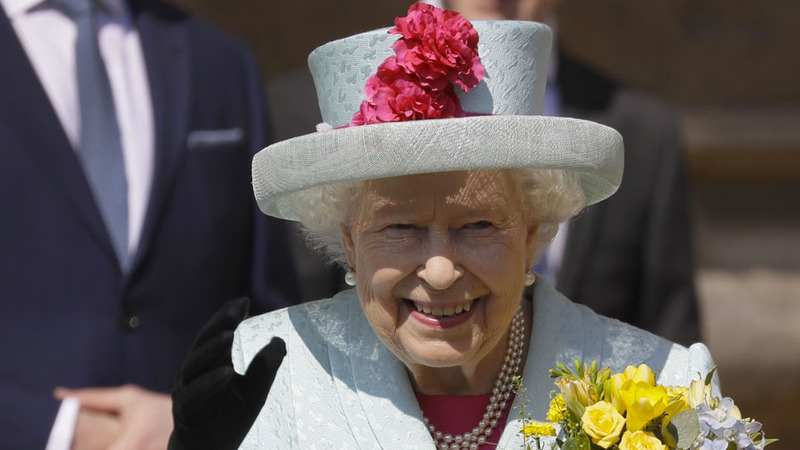 He finished the speech, one of the most eloquent of his presidency with, "All free men, wherever they may live, are citizens of Berlin, and therefore, as a free man, I take pride in the words Ich bin ein Berliner." 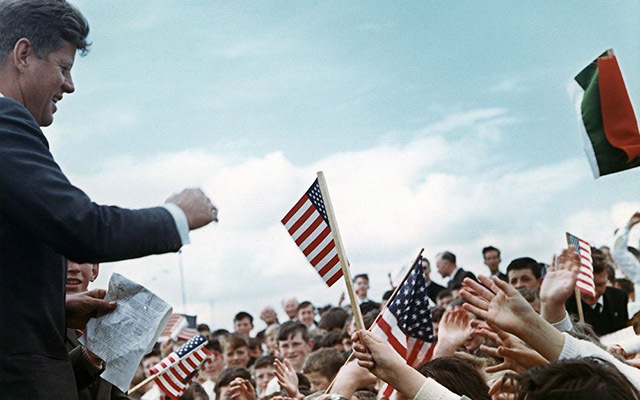 President Kennedy's trip to Ireland. 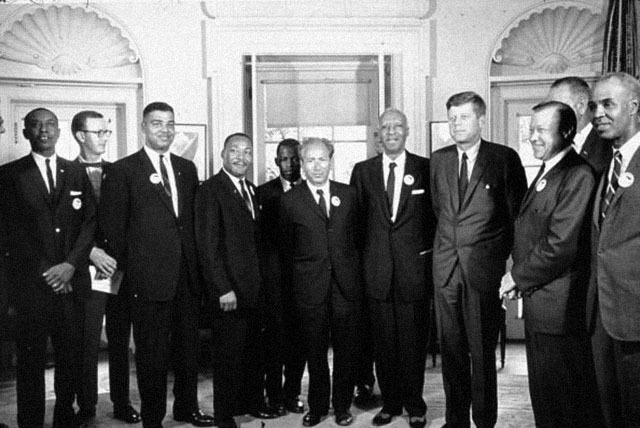 Kennedy with leaders of the March on Washington including Martin Luther King (fourth from left). 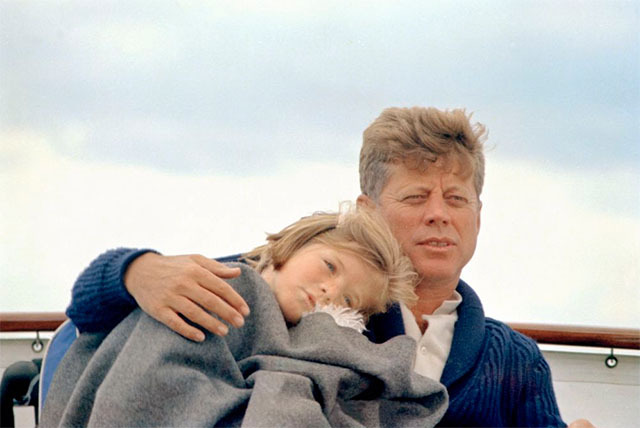 President Kennedy and daughter Caroline Kennedy aboard his boat, the "Honey Fitz". 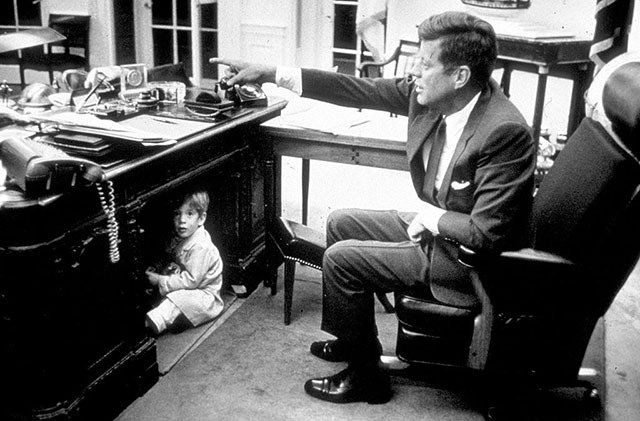 The president plays with his son John F. Kennedy Jr. in the Oval Office. 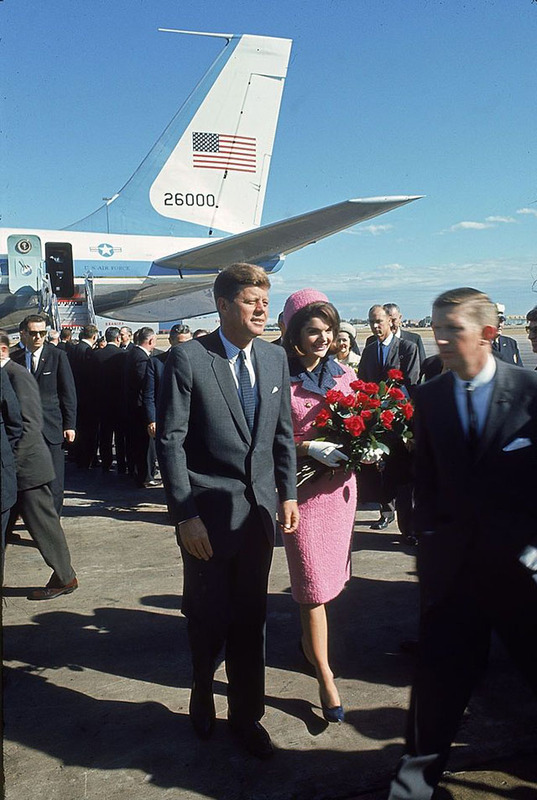 The President and First Lady arrive in Dallas, Texas on the day of his assassination. 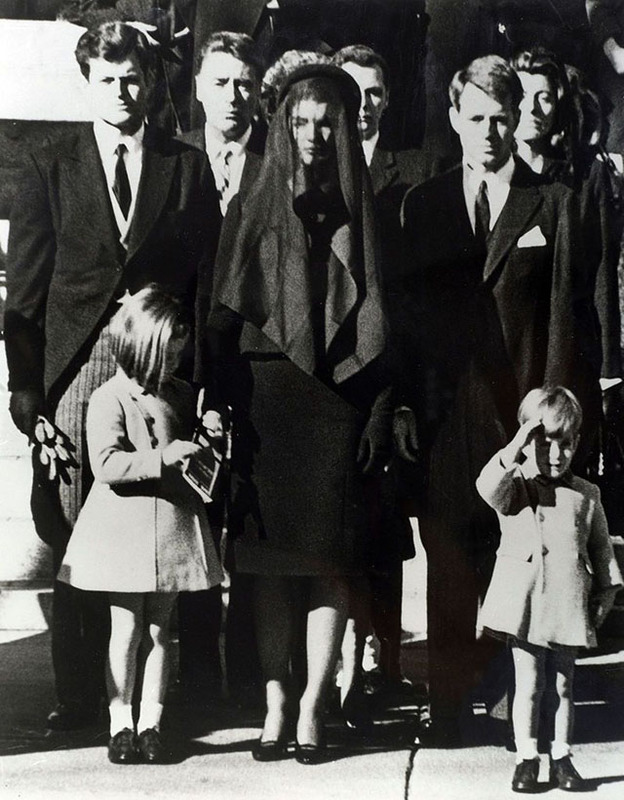 The Kennedy family mourns the death of President John F. Kennedy.